Garlic Lamb & Arugula – Happy Labor Day! Can you believe Labor Day weekend is upon us? How did this happen. Summer FLEW by. But let’s not dwell on that, instead let us get amped up for a fun, long weekend. And what goes hand in hand with a holiday weekend…?! Food. 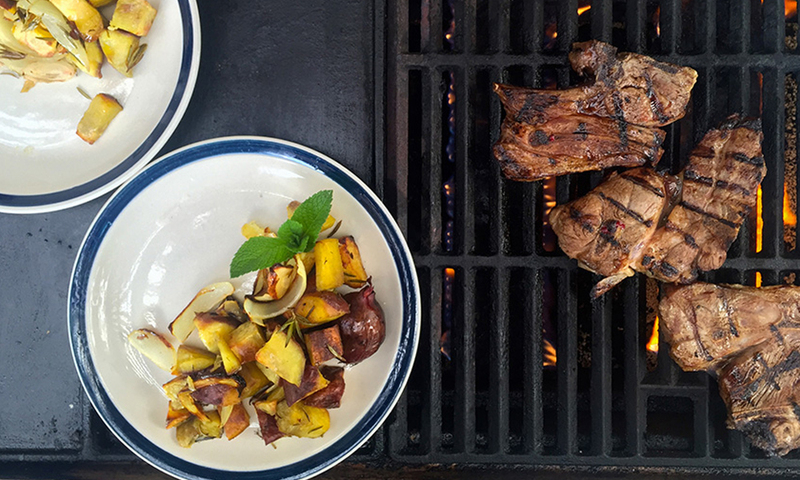 Enjoy this gem of a recipe for your grilling fun. It’s a crowd favorite. *Optional, we love this served with grilled sweet potato as well. Simply cut potato(es) into thin wedges, brush with a bit of olive oil and season with salt and pepper. Grill until golden brown on all sides, serve with fresh herbs (we love chopped rosemary) and the lamb. Light a grill or heat a broiler. In a shallow dish, combine olive oil, minced garlic, rosemary, sea salt and pepper. Add the lamb rib chops and pat garlic mixture on them. Grill the lamb over high heat or broil for 5 minutes per side or until medium rare. Serve the lamb on a bed of arugula alongside the optional sweet potatoes. Recipe courtesy of Body Nourish.